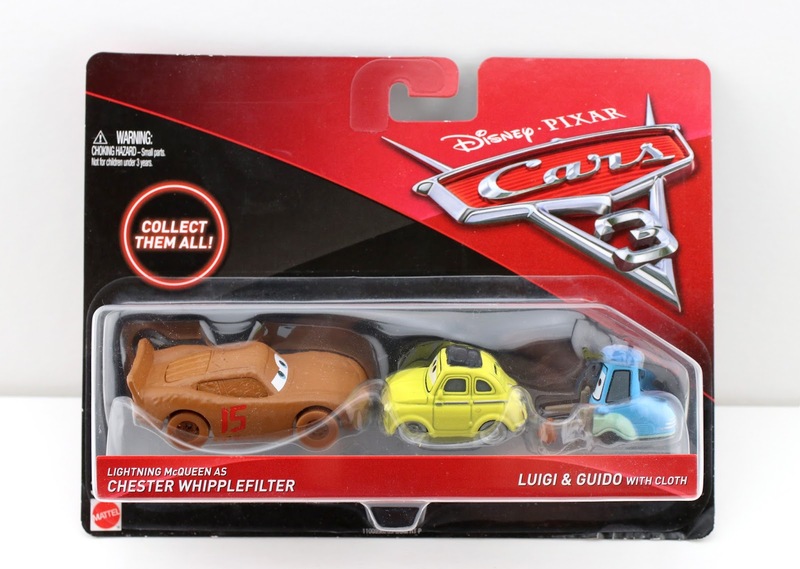 I'm back for another Mattel Cars 3 1:55 scale diecast review and tonight I'll be taking a brief look at this "movie moments" 3-Pack featuring Lightning McQueen as Chester Whipplefilter, Luigi and Guido with cloth! This set was released clear back on May 1st of last year as part of the initial launch of Mattel Cars 3 toys. So yah...this post has been a long time coming! I really like this muddy McQueen (the name Chester Wipplefilter still cracks me up) and it's fun to have a new variation on Guido (first time he's ever come with a cloth). Luigi on the other hand is the same as he's always been. 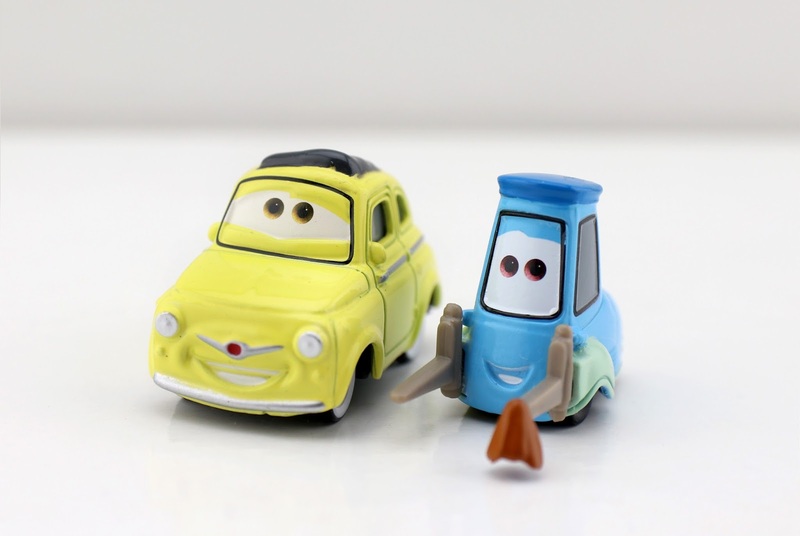 Maybe, for Luigi and Guido, Mattel could have added some subtle mud splats near their tires to make them a little more special/exclusive? That's my only gripe. That would have been a nice detail. Let's take these guys out of the package for a closer look! 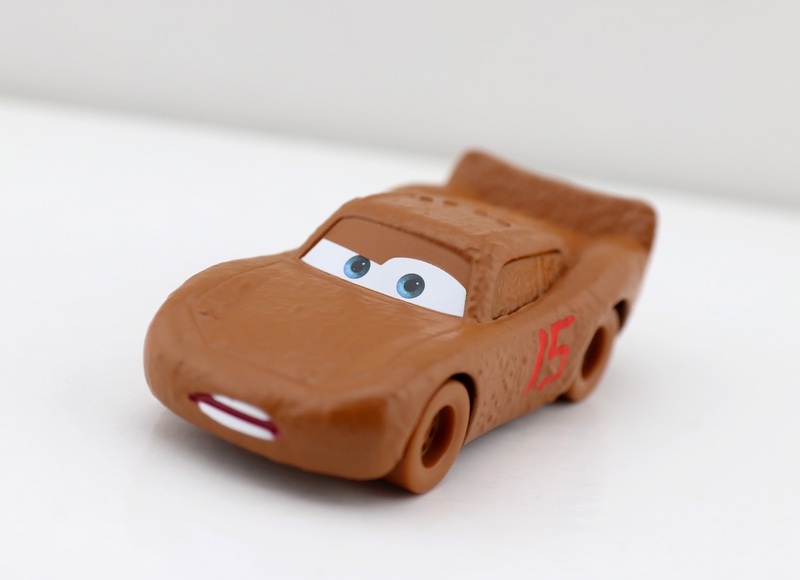 This same Chester Whipplefilter McQueen has also been released on a single card AND in the "Thunder Hollow 5-Pack" (Walmart exclusive). There is also a synthetic rubber tires version that comes with two burning barrels (part of the Walmart "Demo Derby" sub-line), which is only subtly different from this one. I'll be posting on that release soon. As of right now, this 3-pack is the only way to get Guido with cloth. This set is still so easy to find that it's scary. After almost a year, every Target, Walmart, Toy R Us and Kmart in my area has several of these still on the pegs. That's just crazy talk! I don't know how they could have overestimated so much with those first couple Cars 3 cases. It's virtually all my stores carry to this day. So in short, if you're still looking to add this 3-Pack to your collection, you shouldn't have any trouble finding it (I've also included a direct link to Amazon below). Let me know your thoughts in the comments section! Is this one still everywhere in your area too? Toy Story: Army Man Funko "POP!"